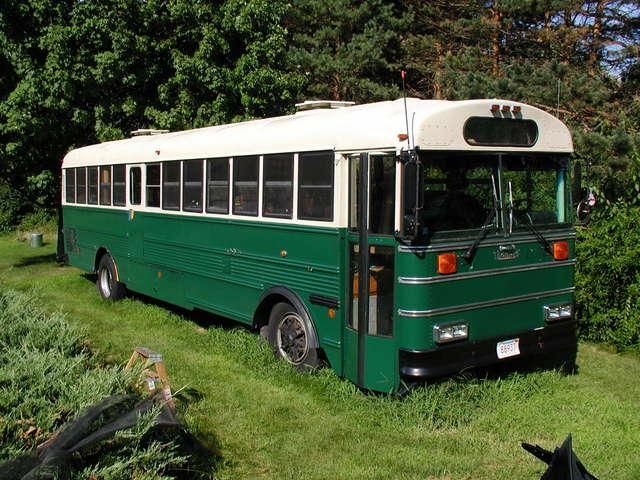 As a young college student in the 80s, Jake von Slatt was thumbing through books when he stumbled upon a book about converted buses. His interest was piqued, and he decided to finally bring his ideas and inspiration to fruition when he purchased a 75 passenger bus on eBay in 2004. With hard work, plenty of elbow grease, and well thought out plans, von Slatt set out to bring his project to life on a workable budget, and ended up with a charming camper that's perfect for weekend getaways with family and friends. Before setting out to convert the bus, von Slatt drew up careful plans that allowed for a kitchen, living area, bathroom, and two sleeping spaces. As you enter the bus, you notice a custom built wooden railing that leads into the home. Soft carpet and light shades of green bring to mind a ocean-inspired getaway, which is the look von Slatt was hoping to achieve with the design of the home. 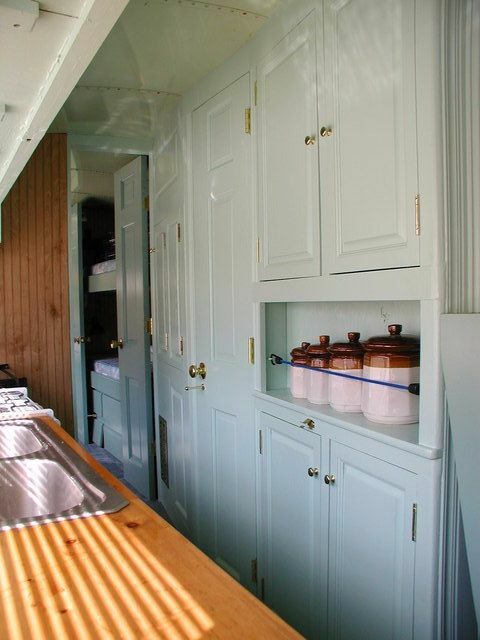 A built-in booth, made with the vehicle's original seat frames, and a table made from a door creates plenty of room to dine across from the fully stocked kitchen. 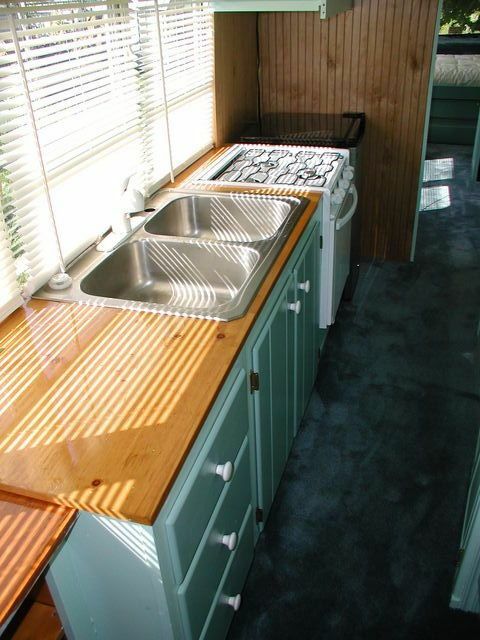 The kitchen offers a dual sink, full-sized range, dorm refrigerator, and plenty of custom built drawers and cabinets. Overhead cabinets add even more space to the area and maximize the room that's available. The wooden propane stove, which provides heat to the bus, sits next to the kitchen behind the captain's chair. Across from the kitchen, even more storage exists in the form of pantry cabinets and a built-in shelf. 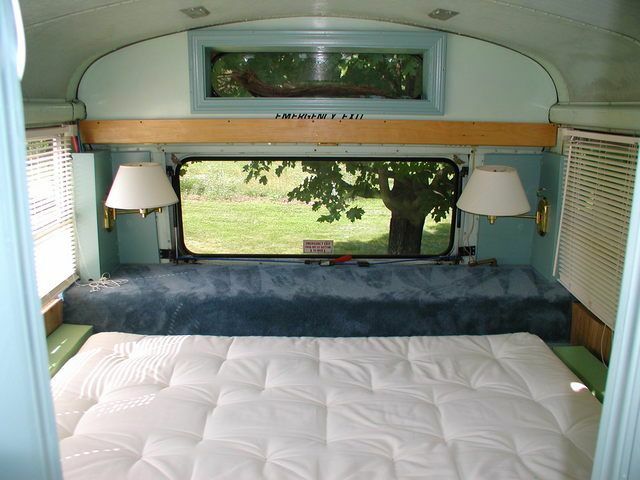 A light green paint covers the interior of the bus, which feels tranquil and soothing. The door to the bathroom is adjacent to the pantry. Continuing past the kitchen behind a door that can close for privacy, you'll see built-in bunk beds on the right side. This sleeping nook makes the most of a small space, and offers a beautiful wood paneled wall as well as two twin sleeping areas. It actually serves to create two distinct sleeping areas, which feel like separate bedrooms/sleeping spaces to create an even roomier living environment for more than one person. 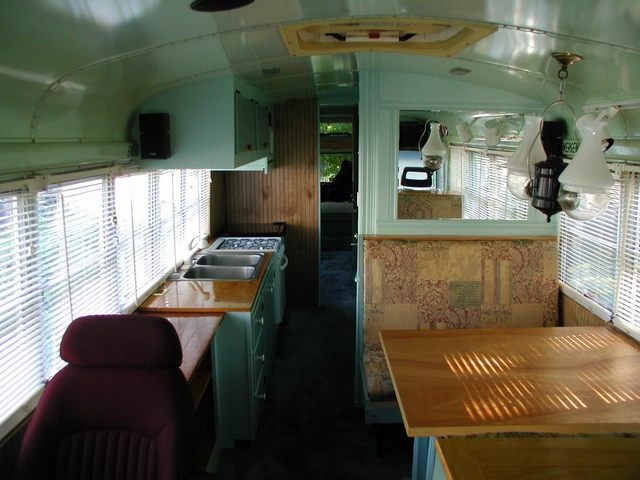 The back of the bus contains the master bedroom. It is large enough for a full bed, and includes a carpeted area that von Slatt uses as a nightstand. 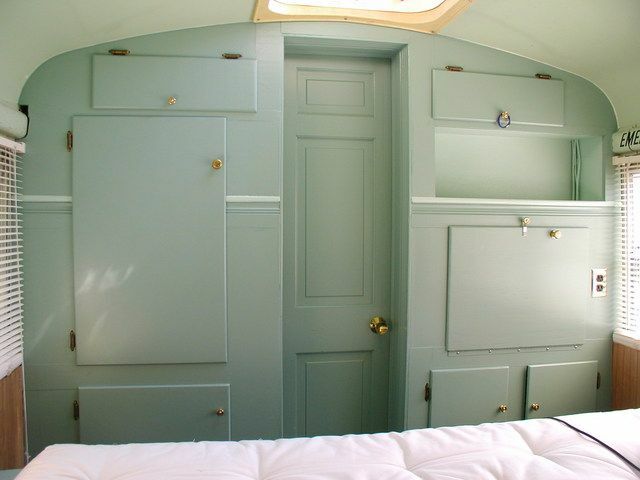 Built-in cabinets on the opposite side of the bed hold clothing and shoes, and the bedroom also has a small door to keep the two sleeping areas private. The bathroom holds the home's water heater as well as a custom wooden medicine cabinet, wooden walls, and built-in shelving. 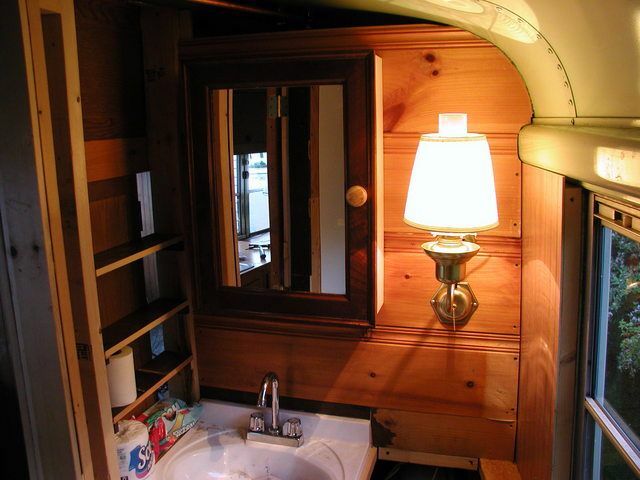 A small sink, standing shower, and toilet complete the space. Lighting throughout the home is a combination of kerosene and electric lighting, creating just the right atmosphere von Slatt hoped to achieve. 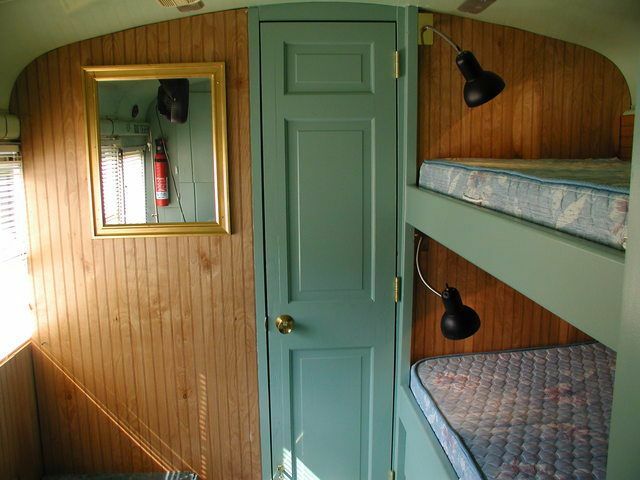 He's fond of purchasing antique fixtures and restoring them to use on the bus, with charming results. Using recycled materials whenever necessary, von Slatt created a relaxing camper that offers inhabitants a luxurious, cozy outdoor experience.